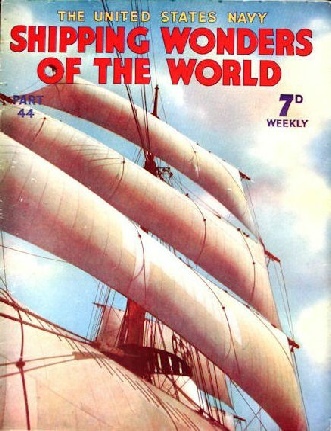 Part 44 of Shipping Wonders of the World was published on Tuesday 8th December 1936. 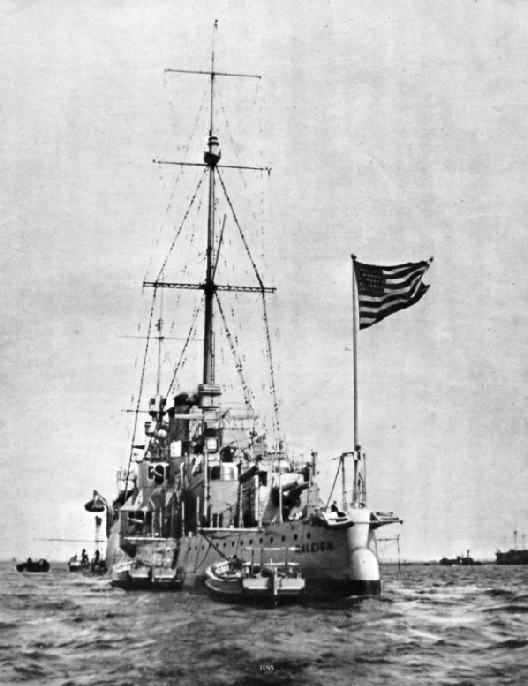 It included a centre photogravure supplement illustrating ships of the United States Navy, which formed part of the article on The United States Navy. The title of this week’s cover is “White Wings”, and the picture has an interesting history. It was kindly lent to me by an old friend whose husband was a sailing-ship man. I am usually unwilling to publish on the cover a picture of which I cannot give you full particulars, but in this instance I decided to make an exception. I cannot get in touch with the lady who lent me the picture, as she is on the Continent at the time of writing. It is such a splendid picture, however, that it deserves to be shown on our cover. RISING TO THE SURFACE after having lain in 18 feet of mud. Sixteen 9-in steel cables were slung beneath the Brussels from the four lifting craft. The 18-feet rise of the tide raised the lifting vessels, and with them the Brussels was raised to the top of the mud. 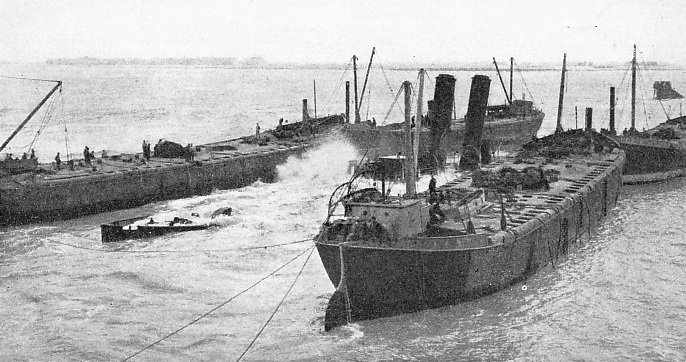 By pumping out their tanks the lifting vessels gained a further 4 feet, which enabled them to tow the vessel out of the congested harbour to be beached. Only half a mile from the yard on the Clyde where the Queen Mary was built there was launched, eighty-tow and a half years ago, a ship called the Edina. The Edina is still in service, as Australian readers will know, and is one of the oldest passenger screw steamers in the world. For more than eighty years the Edina has been in service, mainly in Australian waters. She is a popular veteran and is affectionately known by many nicknames, including “The Old Lady of Port Phillip”. She has had a most varied and adventurous career. Soon after her completion in 1854 she was requisitioned to carry horses and provisions out to the Crimea. Not long afterwards came the American Civil War (1861-65), and the Edina took part in that too. Next she was placed on the Australian trade, to carry emigrants after the discovery of gold. Later still she was bought by an Australian owner and plied between Australia and New Zealand and on various other routes. Her career was not free from accident, and she was involved in several casualties, but luckily it was always possible to repair her. When in 1934 HRH the Duke of Gloucester visited Australia in HMS Sussex, the Edina was the first vessel to greet the Sussex with a signal message. The Edina has carried thousands of passengers between Melbourne and Geelong (Victoria), and doubtless many of my Australian readers have travelled in her. Here F Dickson Gregory tells the story of the “Old Lady of Port Phillip”. The story of the sinking and salvage of the Brussels, concluded from part 43. LATTICE MASTS, at one time such a distinctive of United States battleships, have been replaced by tripod mast, of the British type, in the more recent battleships. 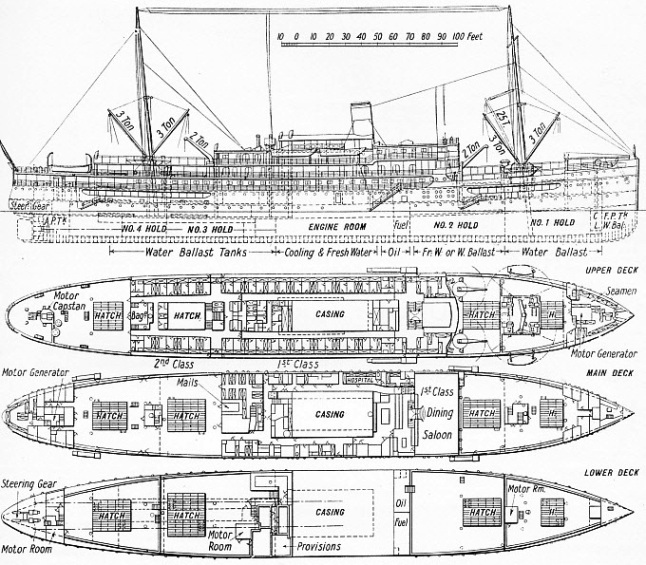 The Arkansas, built in 1910-12, has a standard displacement of 26,100 tons and a speed of 21 knots. She has an overall length of 562 feet, a beam of 106 feet and mean draught 26 feet. 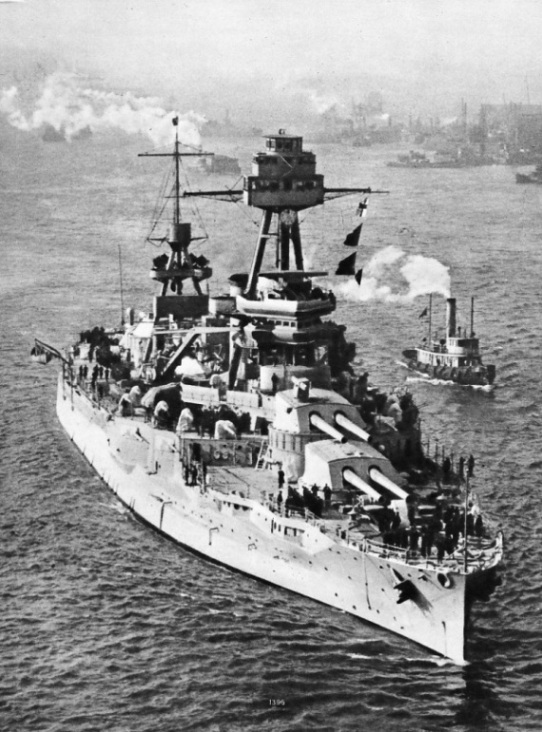 This photograph was taken before extensive alterations were made to the Arkansas in 1925-27, when one funnel was removed. The Royal Packet Navigation Company maintains services ranging from long-distance runs between Java and Sydney, New South Wales, to short runs involving many stops among the islands of the Dutch East Indies with little vessels of the coastal type. The Ophir is in size and capacity midway between the large vessels on the Australian trade and the small ships in the inter-island business. She is engaged in the express service along the north coast of Java, in which there are sailings twice a week in either direction between Batavia and Surabaya, with a call at Semarang. The Ophir is a motor-driven vessel of 4,070 tons gross, with accommodation for 62 first-class and 48 second-class passengers. Completed in January 1929 in Amsterdam, she has a length of 370 ft 5 in, a beam of 51 ft 8 in and a depth of 19 ft 10 in, her load draught being 20 feet. Propulsion is by means of two Werkspoor four-cycle single-acting engines, each having seven cylinders of 23.5 in diameter and 41.75 in stroke. The total power developed is 4,600 bhp at 125 revolutions. An examination of the drawing below shows the vessel is intended exclusively for work in tropical regions. This is apparent from the high ‘tween deck spaces, which are open at the sides as much as possible. The cabins are mostly outside cabins with wide windows instead of port-holes, and the public rooms are particularly well ventilated. On all the weather decks it will be noticed the heavy awnings which are typical of vessels operating in the tropics. There is ample provision for cargo carrying. There are four holds, served by hatches on the upper and main decks. There is also provision for the carriage of cargo under insulated conditions. Cargo is handled by 3-tons derricks and 2-tons electric cranes. On the foremast there is also a 25-tons derrick which is used for lifting heavy weights. There is a double bottom all fore and aft, and this is used for fuel oil, fresh water and water ballast. This is the thirty-fourth article in the series on Merchant Ship Types. BUILT IN 1854, the Edina is still in active service after many adventures. She is an iron vessel, originally of 322 tons gross, built by Barclay Curle and Company and launched in Glasgow on May 5, 1854. This photograph shows how she appeared thirty years later, in 1884, after she had been overhauled and re-rigged with two pole masts. The two most striking features of the modern United States Navy are the strength and power of the battleships and the number of destroyers and submarines. It is quite true that American films have done much to make known the United States Navy, but not always quite correctly. This chapter by Hector C Bywater is the first in a new series on the Fleets of the Foreign Powers. Many readers have expressed the hope that after having dealt with the Navies of Great Britain and her Dominions, Shipping Wonders of the World would go on to include accounts of the various other naval Powers. This series on the world’s navies will give a comprehensive account of the naval forces of various countries. Adapted by her owners, the Blue Star Line, for pleasure cruising, the Arandora Star takes a limited number of passengers on long or short voyages to some of the most attractive regions in the world. 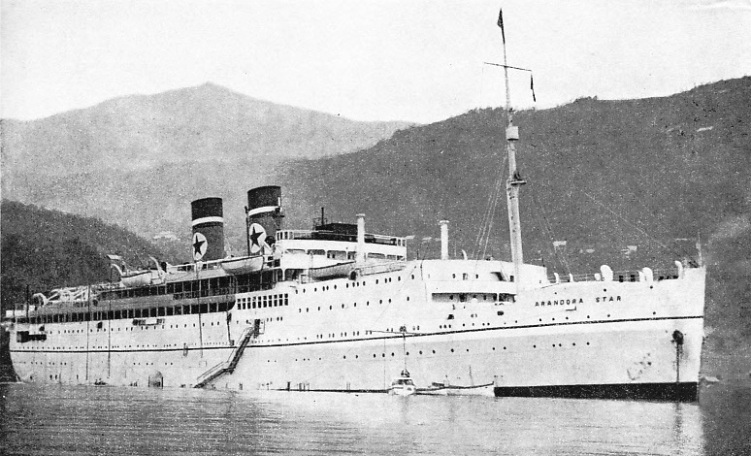 We can voyage by proxy in this chapter about the Arandora Star where F E Dean describes this luxury liner, and then goes on to write of the cruises on which she is employed. The traveller in the Arandora Star can take his choice of a trip to Honolulu, touching at many ports having historic associations, to the Norwegian Fjords, or to many other fascinating parts of the world. 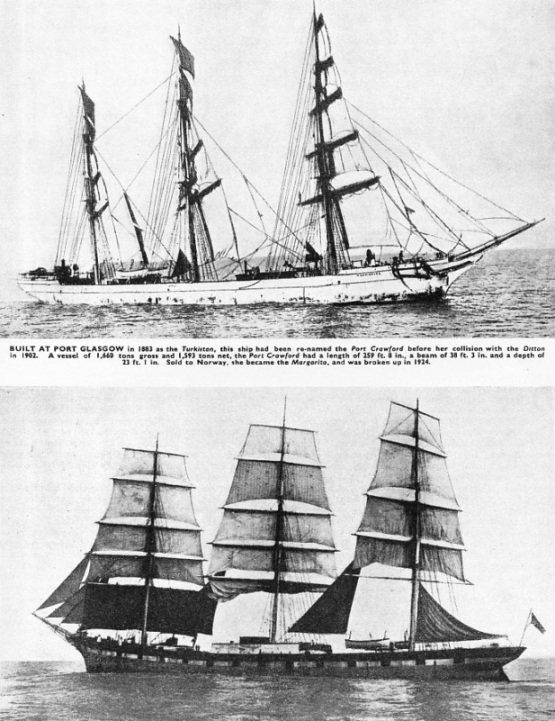 The Arandora Star also featured in the earlier chapter on British Shipping. IN NORTHERN WATERS. The Arandora Star at Ulvik, Norway, near the head of the Hardanger Fjord 70 miles long. A three weeks cruise from Tilbury, Essex, covering 5,300 miles, includes calls at the Faeroes, Reykjavik in Iceland, Spitsbergen (Svalbard), the North Cape and Hammerfest. Hammerfest is the most northerly town in the world. Here the sun does not set from May 13 to July 29, and it does not rise from November 18 to January 23. Going south, the Arandora Star finds her way into one or other of the Norwegian fjords before returning to England. The longest of these is the Sogne Fjord, 112 miles long. The new Welland Canal, a masterpiece of modern engineering, is the fourth of a series of canals designed to link Lake Ontario and Toronto with Lake Erie and the rest of the Great Lakes system. The Niagara Falls have always been a hindrance to water transport in North America, and the fourth Welland Ship Canal is described in this chapter by Sydney Howard. The canal is the latest of the artificial cuts by-passing this formidable natural obstacle. The new Welland Canal, opened in 1932, connects Lake Ontario with Lake Erie. This article is the seventeenth article in the series on World Waterways. 55 ft 4 in and a maximum draught of 14 ft 4 in. The Raleigh is armed with ten 6-in and four 3-in anti-aircraft guns. STEAMING UP THE EAST RIVER, on her way to Brooklyn Navy Yard, the United States battleship Texas. Completed in 1914, the Texas - with her sister ship, the New York - has a displacement of 27,000 tons. Her reciprocating engines have a designed horse-power of 28,100 and give her a speed of 19.7 knots. She has a length on the water-line of 566 feet, a beam of 106 feet and a mean draught of 26 feet. 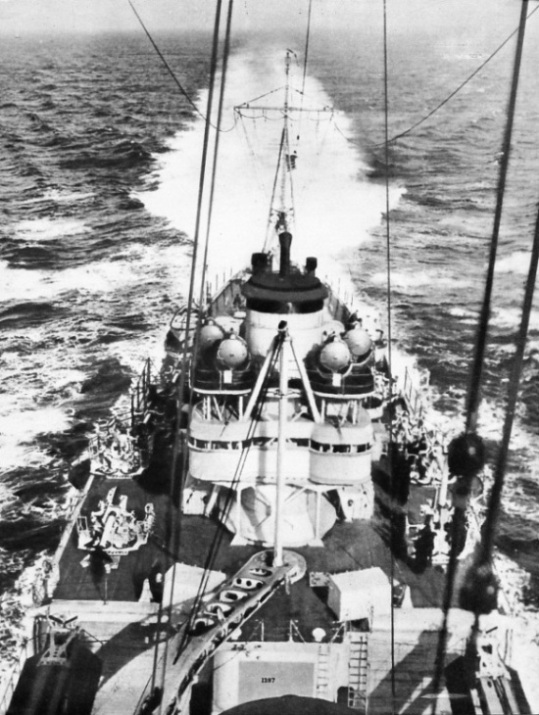 A WHITE WAKE FAR ASTERN is left by the cruiser Indianapolis at speed. Her four screws are driven by 107,000 horse-power turbines, which give her a speed of nearly 33 knots. The Indianapolis, completed in 1932, has a displacement of 9,950 tons. Her overall length is 610 feet, her beam 66 feet and her draught 17 ft 6 in. 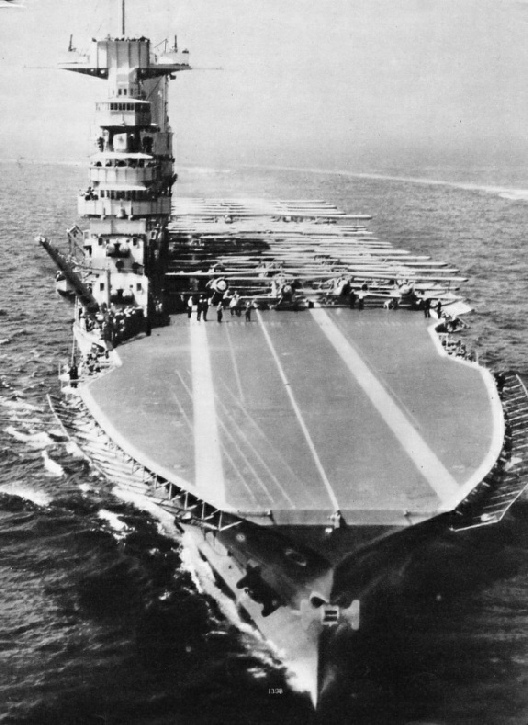 She is equipped with two catapults and carries four aircraft. THE LARGEST GREAT LAKES FREIGHTER passed through Lock No. 7 of the Welland Canal to perform the opening ceremony on August 6, 1932. The Lemoyne was carrying 500,000 bushels of wheat on a draught of 19 ft 6 in. Of 10,480 tons gross, the Lemoyne has an overall length of 633 feet, a beam of 70 ft 3 in and a depth of 25 5 in. Having learnt navigation in a public library, a young American, William Albert Robinson, sailed round the world from New York between June 1928 and November 1931 in a ketch only 32 feet 6 inches long overall. More than one little ship has circumnavigated the globe. Among the most interesting was the Svaap, owned and sailed by William Robinson. Robinson wrote a book a bout his voyage entitled Deep Water and Shoal. He has just published another book called Voyage to Galapagos. This intrepid yachtsman sailed from New York on June 23, 1928, and returned to New York on June 23, 1931, after having sailed round the world. This chapter is by Sidney Howard and is the ninth article in the series Great Voyages in Little Ships. The article is concluded in part 45. THE KETCH THAT CIRCUMNAVIGATED THE GLOBE, Robinson’s Svaap, was bought second-hand for the equivalent of £400. She was designed by John Alden, of Boston, and built in 1925 in Nova Scotia. Her length was 32 ft 6 in overall and 27 ft 6 in on the water-line. Her beam was 9 ft 6 in and her draught 5 ft 6 in. She was fitted with a 10 horse-power auxiliary engine. The Svaap is seen above in the Indian Ocean. IN SQUALLY WEATHER the Ditton had one tug to tow her into Newcastle Harbour, New South Wales, in April 1902. Lying at the Farewell Buoys were the Port Crawford and the Peeblesshire, loaded and ready for sea. A heavy squall struck the Ditton and the force of the wind caused her to break her tow rope. She ran straight into the Port Crawford and her bowsprit knocked the foremast out of the stationary vessel. Heavy damage was inflicted on the Port Crawford and the Ditton, but the Peeblesshire was protected to a certain degree by the Port Crawford. 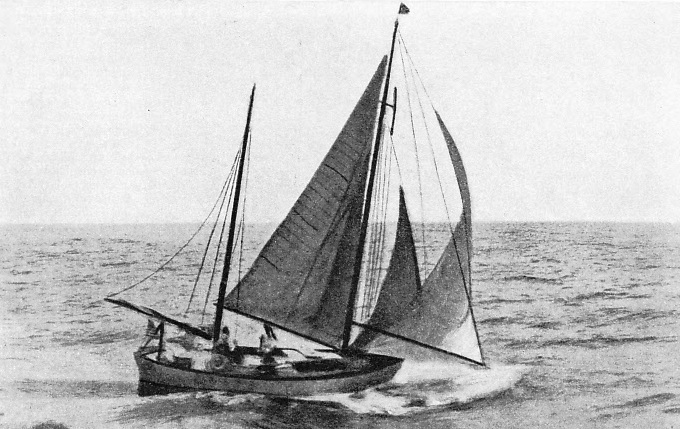 The Ditton’s bowsprit snapped off close to her bows, and one man, who was making fast one of the jibs on the bowsprit, was killed. 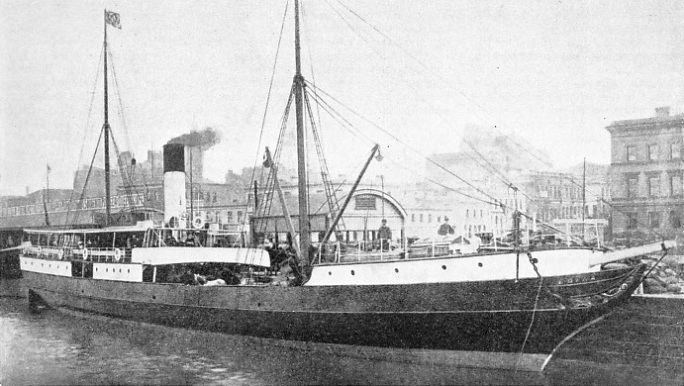 The Peeblesshire was a vessel of 915 tons gross, built at Port Glasgow in 1879. She had a length of 200 feet, a beam of 32 ft 8 in and a depth of 19 ft 7 in. 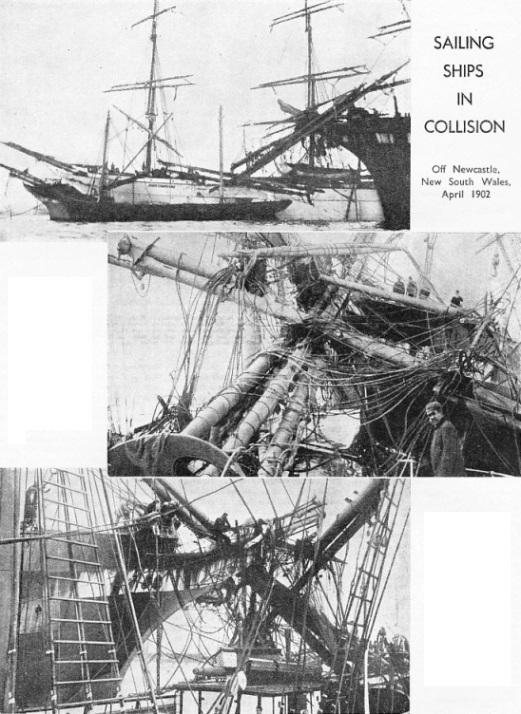 She ended her days under the Norwegian flag and, as the Bergliot, was wrecked in February 1907. BUILT AT PORT GLASGOW in 1883 as the Turkistan, this ship has been re-named the Port Crawford before her collision with the Ditton in 1902. A vessel of 1,660 tons gross and 1,593 tons net, the Port Crawford had a length of 259 ft 8 in, a beam of 38 ft 3 in and a depth of 23 ft 1 in. Sold to Norway, she became the Margarita, and was broken up in 1924. PROBABLY THE LARGEST FULLY-RIGGED THREE-MASTED SHIP ever built, the Ditton had a gross tonnage of 2,901 and a net tonnage of 2,699. Built at Milford Haven, Pembrokeshire, in 1891, she was 311 feet long, with a beam of 42 ft 4 in and a depth of 25 ft 8 in. In 1921, as the Norwegian vessel Bragdo, she made the voyage from Wallaroo (South Australia) to Queenstown (Ireland) in eighty-five days and discharged her cargo of wheat at Liverpool. She then left for Norway but was wrecked on November 2.